Musselburgh made it two wins out of three on Saturday in Baillie Gifford East One with a home victory over West Lothian. They did not give West Lothian a sniff at Lewisvale, bowling them out for just 50. The hosts then reached their victory target for the loss of just one wicket in the 12th over. 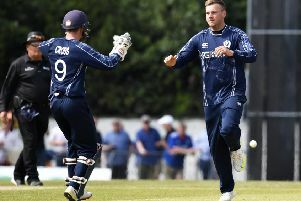 South African Cheslyn Clark hit 112 not out to help Edinburgh South chase down Watsonians II’s score of 180 to win the match at Craiglockhart. Heriot’s II were in good form at Goldenacre to defeat St Boswells. The home side bowled the Borderers out for 110 and then, despite a few wobbles, reached their target with one wicket in hand. Elsewhere in the division, Edinburgh Accies’ match at Dunnikier was postponed while Gala and Kelso played out a tie. In East Two, Mark Burgess hit 93 for SMRH II, but it was not enough to secure a win against Morton. In a match reduced to 40 overs at Inverleith, SMRH made 207 all out batting first. In reply Arunkumar Daniel made 47 not out as Morton won by seven wickets. Livingston made it two wins from two with a victory over West Lothian II. At Boghall the visitors made 223-3 then dismissed WL for 76. In East Three, Drummond Trinity lost by one wicket to Dunfermline Carnegie.